Oh the excitement! 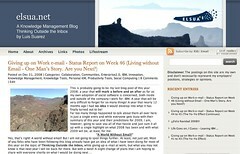 It looks like the new upgrade of the blog template over at http://www.elsua.net has been a total hit! Plenty of folks have dropped by the launch entry, as well as through Twitter, to comment on how much better the new design is, compared to the old one, and although I am sure the other two blogs I maintain will keep the same flavour they have been having I can surely guarantee you it is quite a rush receiving all of the positive commentary and quite motivating to keep things going with some more regular blogging. And since we are starting another year, why not, right? Well, here I am again then, putting together a follow up blog post to the one from yesterday where I will be commenting further on some of the various different changes that will be taking place over at elsua.net and which, in a way, will also affect to some extent how I will keep things going with all of the blogs I currently look after. Archives: One of the sections I am most excited about and which I was really looking forward to finally have it as part of the blog. A lovely, and nifty, index of the over 866 blog posts I have put together in elsua.net, so if you are looking for something I may have blogged about in the past you will be able to find it through there much easier! Oh, and the Search function now works, too! Links: For a good number of months I was using a blogroll injected directly from BlogLines, where folks could check out some of the current reading I was doing. But then things got messy and I eventually had to take it down. However, since plenty of folks have been asking me about it again in the recent weeks I thought it would be nice to recover it and that’s why under Links you will find my current blogroll of over 270 feeds, because, yes, indeed, I still read feeds (As well as Twitter!). Don’t you? Photos: Definitely, this was one of the sections I was really looking forward to, but never thought I would have a chance of implementing it. But, again, thanks to the lovely piece of work from Laura Whitehead, under Photos you would now be able to get a glimpse of all of the photos that I get to share in my Flickr account, without you having to go anywhere else. Over there you will be able to find pictures from all of my travelling (Getting started with 2009’s in just a few days from now, by the way!) 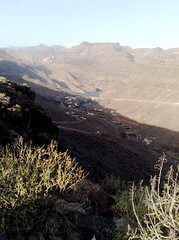 as well as from the place where I have lived for the last five years: Gran Canaria. And that would be it, folks! Some of the most striking, and new, changes that you would be able to notice on my main personal / business blog on the Internet. The rest you would notice how it is much cleaner, a lot less clutter, plenty less widgets (I have only kept there MyBlogLog, since I still make use of it to a certain degree) as I was fully aware how much noise they added to the template as well as slowing down the overall Web site itself. So I decided to take them all down! Finally, you would also see how for each of the blog posts I will be putting together you will have an opportunity to weigh in your thoughts not just with comments, but also with ratings (Thanks to the GD Star Rating WordPress plugin put together by Milan Petrovic), as well as share across that specific article in various social bookmarking and social networking sites, thanks to another really nice WordPress plugin called Sociable, put together by Joost de Valk. Big, big news today! Specially for those folks out there interested in wikis and adopting wikis within the enterprise. I am sure that by now you may have read about them, since a couple of folks have already blogged about the massive announcement, but, nevertheless, just in case you may have missed it, I will share a couple of lines on it over here. Stewart Mader, author of the superb Grow Your Wiki, is going solo & starting his own consultancy business around organizational wiki adoption. Wooo-hooo! Congratulations, Stewart!!! Way to go!! In case you don’t know much about Stewart, which I doubt, since he is a very prolific blogger, incredibly engaging speaker, writer of one of the most essential books on wikis and corporate wiki adoption: Wikipatterns, active twitterer, too (On top of various other social networking sites! ), I can honestly say that you are missing out on one of the smartest talents within the Enterprise 2.0 space we have nowadays. Either way, if you haven’t subscribed to his blog, I can certainly recommend you do so, more than anything else because otherwise you are missing plenty of good quality materials like 21 Days of Wiki Adoption that I have blogged about over here a little while ago. Well done, Rafa!!! And very much well deserved, too! Perhaps only one thing to say would be a special thanks to these two titans for making a Sunday afternoon, 6th of July 2008, an unforgettable one!